Subject: Plate : 'Rajah de Dao.' (A man from the Maluku / Moluccan islands Indonesia). Condition: Good. General age related toning. Light soiling and occasional light foxing. Medium: Lithograph on a vellin type paper. Original hand colouring. Size (in cm): The overall size is ca. 16 x 26 cm. The image size is ca. 8.5 x 12.5 cm. Size (in inch): The overall size is ca. 6.3 x 10.2 inch. The image size is ca. 3.3 x 4.9 inch. 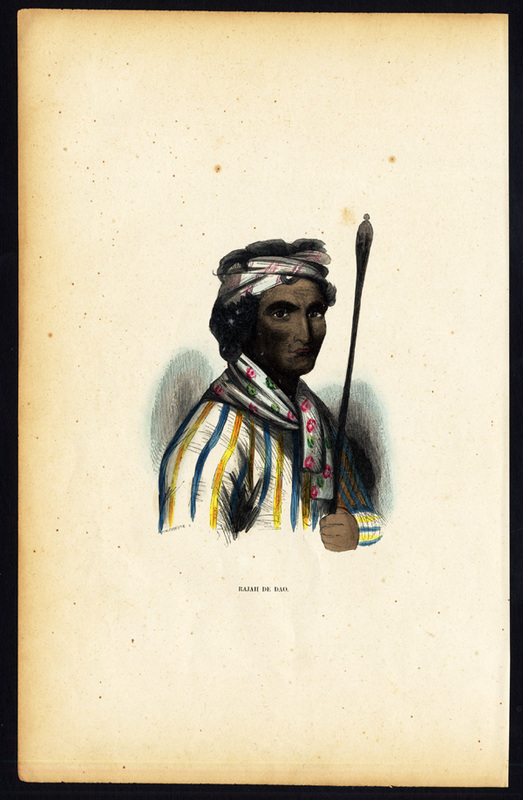 Description: This original antique print originates from 'Moeurs, Usages Et Costumes De Tous Les Peuples Du Monde ..' by Auguste Wahlen, published in Brussels 1843. Artists and Engravers: Auguste Wahlen, author.